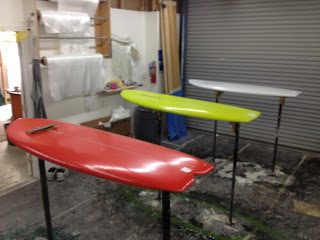 Here are the three mini-Simmons shapes I did a few weeks back, drying on the racks after hot-coating. The board in the foreground is a notch tail. the middle board is a diamond tail and the board in the background is a square tail. The popularity of these boards has spread up the coast from San Diego, and is now catching on in Ventura county. The M-S is a great shape for the slopey waves at the point, especially during those high-tide sessions. Shaped under the “R. Lucke” label, two of the boards above have already sold. We just received a shipment of four more blanks. Orders yours today!